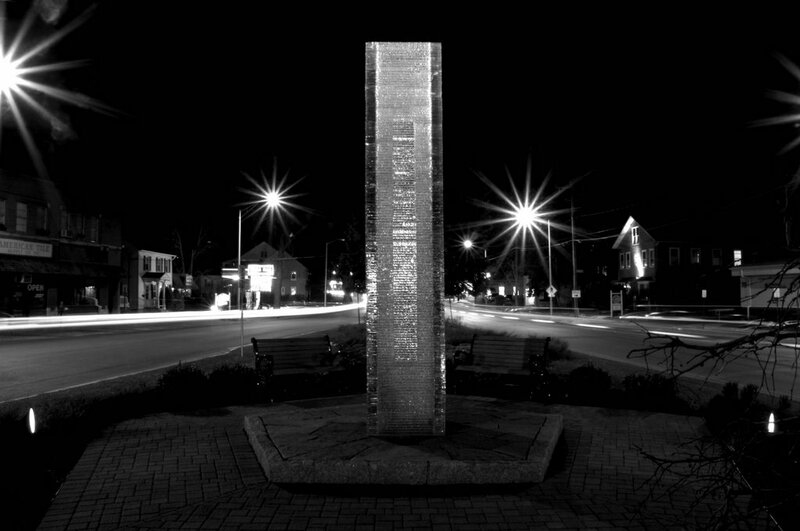 9-11 memorial, Main Street Danbury CT.
FLASHBACK POST: Who is Republican Registrar of Voters Mary Ann Doran? In honor of DISHONEST Mayor Mark Boughton's laughable suggestion that the uproar over the move of the polling place in the 6th ward is politically motivated, here's a closer look at the brainchild behind the voter suppression movement...the infamous Mary Ann Doran. During my time in the Hat City, I've been a participant of countless conversations with people who go out of their way to give their take on the political history of Danbury...and time and time again there's always a reasonable chance that the name Mary Ann Doran will be referenced (most times, not in a good way). Who is Mary Ann Doran? 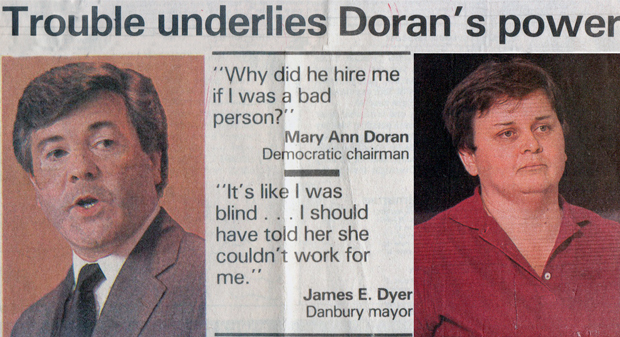 When I first heard the name Mary Ann Doran, I was a student at Western Connecticut State University in late 1980s during a time when the city made state headlines with allegations of corruption and wrongdoing at the mayor's office. From her role in the revelation of a FBI investigation into political corruption in the city, the role she played in the now infamous late night altercation/encounter at City Hall that involved herself, the Danbury Police Department, then Mayor Jim Dyer, as well as other political notables (you gotta read about that episode), and a whole hosts of alleged unethical decisions that could make your head spin, whenever you opened a copy of the News-Times during the latter half of '87, Doran's name was in the headlines..and most of the time, it wasn't a good thing. To put it short, many who had anything to say about Doran are still dismayed that the current Registrar of Voters was rewarded with an elected position given her checkered political past. A few nights ago, I had a conversation with someone who wondered if Doran's past was ever examined by the media. Although twenty-five years ago is a lifetime in political terms, in the late 80s-early 90s, numerous journalism classes devoted to the media coverage of the Dyer controversy and one of the most amazing write-ups from the News-Times at that time centered on Doran's political resume. In July 1987, the News-Times published a massive investigation article on the political history of Doran (reported by Gina Brisgone, Ruth Lockwood, Valerie Roth, and Steven G. Vegh and written by Steven G. Vegh in the News-Times, July 24, 1987), which was required reading for journalism students who followed the Dyer scandal as it unfolded. 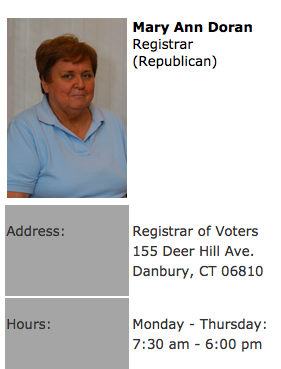 Lets just say that those yearning for a history lesson regarding the current Republican Registrar of Voters (who by the way is still very active in local politics as many consider her to be the real party boss among Danbury Republicans), the following article is for you. DANBURY - Two months ago, Mary Ann Doran was chairman of the Democratic Town Committee, an aide in Mayor James Dyer's office and one of the city's most influential politicians. Doran, 37, controlled virtually all appointments to city commissions, according to City Hall and Democratic sources. "Mary Ann is wielding power through all the commissions," said one source who knows Doran and Dyer. "Who suggested all the names to the mayor for appointments? Mary Ann. All those people owe favors to Mary Ann." She acquired her power because she was a top achiever in a party that unabashedly defends patronage. Her 21-year party career, which started before she graduated from Danbury High School in 1966, has excluded virtually all other interests. Democratic insiders say she has never held a full-time job. Doran won influential Democratic patrons, such as Norman Buzaid, the town committee chairman in the early 1970s who later became a Superior Court judge; Joseph Burke, a long-time Democratic activist; and Dyer. Their interests were her interests; and they rewarded her with part-time jobs in the state Capitol, private business and City Hall. Their aid to her was unflagging, saving her reputation and career more than once as she blurred the boundaries of financial and political propriety. Doran's late-night resignation June 1 from her part-time post in the mayor's office and her announcement that the FBI was investigating corruption by Dyer was, therefore, an audacious step. 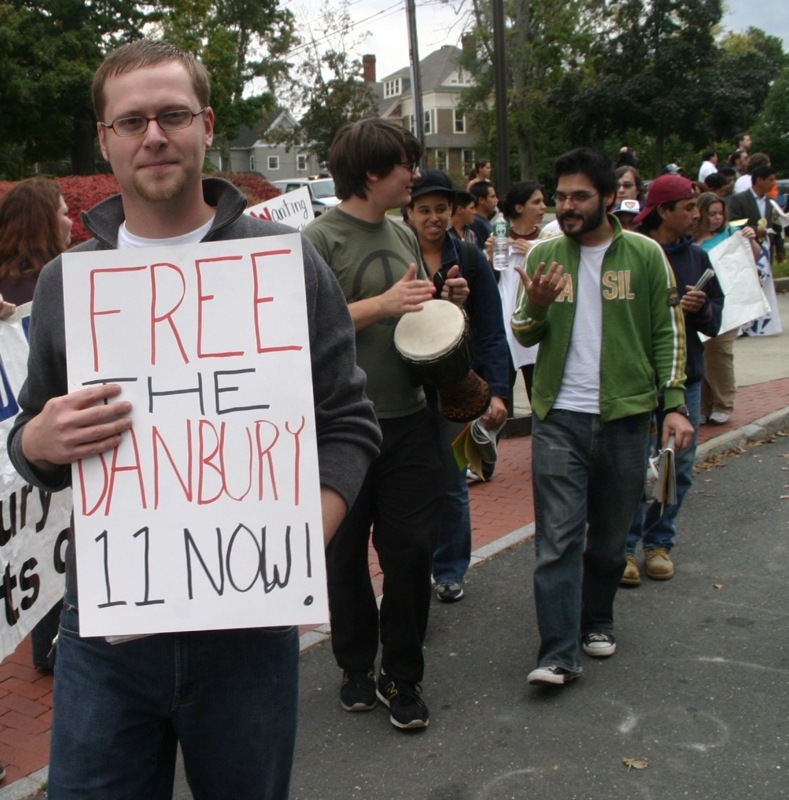 The FBI confirmed a Danbury investigation, but has refused to specify what it is scrutinizing. By revealing the FBI probe, Doran triggered a flood of rumors that continue to immerse the city and have complicated what had been Dyer's likely renomination. Dyer has a re-election committee and so is an official candidate under state law, but has not announced his plans. Doran said that if, as party chairman, she didn't distance herself from Dyer by resigning, the result of the FBI investigation could embarrass Democratic candidates in the coming city election. But sources interviewed during a seven week News-Times investigation said Doran herself has been a potential source of embarrassment for the party. Almost all spoke on the condition that their names not be used. They cited fears that their businesses and jobs, or their standing in the Democratic party, could suffer if they angered Doran. According to those sources, Doran shirked responsibility while a clerk at the state Capitol, mishandled funds while a deputy sheriff and campaigned against Roy Costa, the Democrats' mayoral candidate in 1977. Doran also suggested and accepted a $200 cash campaign contribution from city Planning Director Leonard Sedney in 1983 that was never noted in finance reports filed by either the town committee or Dyer's campaign, as required by state law, sources said. Sedney refused to comment on the donation, which exceeded the legal $50 limit on cash contributions. Doran offered to be interviewed for this article last Friday, but agreed to postpone the meeting until this week, However, she canceled an interview set for yesterday and said she would be unavailable until next week. Doran also questioned the importance of events a decade old, and suggested that the current FBI probe centers on authentic, important illegalities. Doran questioned Dyer's perception of her, as well. "All I can say is, why did he hire me if I was a bad person? Why did he keep me there if I had done so many bad things?" she asked. Many people in and outside the party say they strongly doubt that Dyer was ignorant of anything Doran did politically before or after she joined his City Hall staff in 1980. A nit-picking, hands-on mayor, Dyer was Doran's close political partner. But Dyer said he knew nothing about Doran's tarnished past until Sedney told him in April about the 1983 contribution. Other acquaintances told him what they knew only after he and Doran broke relations following the June 1 debacle, Dyer said. He said they never told him anything about Doran earlier because they assumed he already knew. "I can't believe what's happening. Everything coming out now about her," Dyer said. "It's like I was blind. Nobody ever told me. When she became the town committee chair, I should have told her she couldn't work for me. I should have recognized the potential for the conflict, and I didn't." The Democratic Town Committee elected Doran chairman in 1982. Frank Klecha and Theodore Goldstein, her two predecessors, said DOran earned the post by working hard and making friends in the party, not through any political power-broker. Dyer agreed, saying Doran alone was responsible for her rise to chairman. "I don't know if I thought it was a good idea, but I certainly didn't discourage it, and that's the mistake I made," he said. Doran was still a student at Danbury High School when she began working for the Democratic Party in the 1960s. A devoted worker, she became the protege of Buzaid, who in turn, acted as her political godfather, even after she joined the town committee in 1974. The relationship paid tangle benefits in 1975 when Buzaid successfully pressed stat Sen. Wayne Baker, a Danbury Democrat, to give Doran a job as clerk on the state legislature's Public Personnel and Military Affairs committee, of which Baker was chairman. State records show that Doran worked part-time fore four months during the 1975 legislative session averaging 25 hours a week and earning somewhat less than the standard $4,000 salary for clerks. As the committee clerk, Doran should have been the lead employee among the committee's clerical staff. Yet "nine times out of 10, Mary Ann didn't show up" for her clerking duties, said a long-time acquaintance of Doran. Several former committee members said they can't recall Doran having any role. "I don't remember Mary Ann, to tell the truth," said John J. Tiffany II, who was the ranking state representative on the committee. Alan J. Mazzola, another committee member, couldn't remember Doran either. But he agreed with several former committee members who said a secretary, Pauline Larson, was their staff keystone. "I was doing most of the work, I will grant you," Larson said. "Mary Ann probably could have put a little more time." Baker refused to comment on Doran's legislative role. Other Democrats, however, said hat thy 1976, Baker and Nicholas Motto, a state representative who co-chaired the committee, were so angry with Doran's truancy that they promoted Larson to clerk. Doran was dropped to secretary, where she continued as a no-show, the long-time acquaintance said. Before Doran landed her legislative post, she campaigned for Gloria Rice Clarke, a Greenwich lawyer who was elected Fairfield County sheriff in November 1974. Seven months later, Clarke favored Doran by appointing her as a deputy sheriff. Deputies generally act as intermediaries between legal opponents by serving legal papers, auctioning foreclosed properties and collecting money won by plaintiffs in lawsuits. Doran started working July 1, 1975, and left on Dec. 31, 1976. It was the money collections that brought Doran, and the local Democratic Party, to the verge of scandal, according to Burke and Harold Rosen, a Democratic stalwart whose wife, JOyce, was an assistant Democratic registrar of voters int he Third Ward in the 1970s. Rosen said he began hearing complaints in 1975 or 1976 from creditors who said Doran owed them nearly $7,000 she had collected from auctions and foreclosures. "Collections were a big problem, disbursement of funds: how it was disbursed, how fast it was disbursed," Rosen said. "That was the only thing Mary Ann was guilty of, slowness in disbursing. A thousand things could have happened between the closing and the time it (the money) was disbursed." Several sources said the creditors who were owned money held by Doran were ready to file formal complaints against her about the time Burke moved to rescue her. "Mary Ann never cam to me," he said. "It was other people who told me." Alarmed at the reports, Burke said he first sought aid from a well-connected lawyer who called Sheriff Clarke. But Burke said he was told that Doran would have to solve the problem herself. So he turned to Buzaid. "I went to Norman about it, and Norman was about to go on the bench (as judge)," he said. Buzaid wrote out a check for $1,200. The check was made out to me, and he and I went to CityTrust and cashed it. … (The problem) got sward off," Burke said. The check was drawn on Buzaid's personal funds and made out by Jimetta Sanaha, Buzaid's legal secretary, who now is the assistant city clerk, Burke said. Burke said he exchanged the cash for a ban check made available to Doran. He gave the check directly to Doran. Her response? "She wasn't grateful, and she was pissed off at Norman for sticking his nose in it," Burke said. Burke was active for decades in Democratic politics and campaigned actively for the late Gov. Ella Grasso and the late U.S. Sen. Thomas Dodd, as wells for U.S. Rep. Wilbur Mills, D-Ark., in his brief candidacy for president in 1972. "He was very active in Connecticut and Massachusetts. I always found him to be very honorable in all his dealing with me," Mills said of Burke from his Washington, D.C., law office. Burke, a former Newtown resident who now lives in Florida, said eh became good friends with both Doran and Dyer in the 1970s through the state Young Democrats organization. He said he aided Doran and Dyer in setting up a Young Democrats branch in Newtown. Both Burke and Rosen said they were willing to speak about Doran's past because they are no longer active in local politics and they were dismayed that Doran accused Dyer of being the target of an FBI probe into corruption. Buzaid and Samaha refused to comment on the incident. Clarke denied knowledge of any impropriety and said she suggested that Doran resign from the sheriff's office because Doran was not thrilled with he post and should leave to open the job to someone with more enthusiasm. Danbury Superior Court documents show the personal financial problems plagued Doran in the next couple of years. In August 1978, the Connecticut National Bank sued her because she had never made good on $2,150 worth of bad checks she had deposited into her account at the bank. Records show that Doran wrote three bad checks between December 1977 and February 1978, and that the bank filed suit six months later because she still had not paid them off. In December 1979, Superior Court Judge Joseph Chernauskas agreed with the bank and ordered DOran to pay the $2,150, plus $41.80 in court costs. Six months later, Doran was sued by the Danbury Savings & Loan Association for failing to pay a $1,205.46 loan she had taken out in March 1978. Doran decided to represent herself in the suit, and in September 1980, Superior Court Judge Howard J. Moraghan ordered her to pay $1,435.11, including interest, in monthly installments of $100. He also said Doran would have to pay $55.40 in court costs. When Doran left the sheriff's department, Burke, then a real estate agent and mortgage broker, hired her to work in his office on Danbury-Newtown Road. Burke said his offer was attractive to Doran because she could do political work while on the job. That work focused on promoting George Massoud as the Democrats' 1977 mayoral candidate. When Roy Costa, a Democratic Common Council member, upset Massoud by winning the party's candidacy in a primary election, Doran and developer Nicholas Attick devoted themselves to Costa's downfall in the general election, Burke said. Boughton, a Republican, was elected mayor in 1977. "She and Nick and I worked together on that fiasco," he said. "Whatever he (Attick) did, she had a hand in, too, because I was helping them too." Burke said they aided Boughton's campaign to snuff out any impetus held by Costa's supporters, who came from outside the town committee. Anonymous letters circulated during the campaign suggested that Costa was a womanizer, and Costa was investigated by a private detective. Burke said he did not know the source of the letters. Attick later pleaded no contest to violating state election law during that campaign and paid a $200 fine. The Democrats not only lost the mayorship but 17 out of the council's 21 seats in that election. In the aftermath, Democratic Town Committee members charged Doran with working for Republican candidates and disloyalty to the party. A panel was scheduled to review the charges and consider dumping Doran from the party. Doran acknowledged that she campaigned for Kathy Sofia, a Republican candidate who won a Common Council seat, but denied working against Costa. The loyalty hearing was canceled and never rescheduled soon after The News-Times reported that several women in the party said their lives were being threatened if they testified against Doran. One of the women said at the time that an unknown phone caller said she wouldn't be safe in her car is she spoke against Doran. Public advices for keeping Doran on the town committee included Dyer, then representative for the state's 110th House District. Dyer said last month that he defended Doran because few Democrats were blameless in the Republicans' sweeping win and because forgetting the past was crucial to Democratic unity. Led by a union of Doran and Dyer, Democrats regained all the top elective posts and most Common Council seats in the 1979 election. Dyer, as the new mayor, rewarded Doran in early 1980 with a part-time job in his office, where she remained until last month. Doran had no academic degrees or experience working in city government, and her job was variously described as conference coordinator, constituent liaison or mayoral aide. Dyer said she was valuable to him in several ways. "By having her here, I at least thought I'd know what she was up to" he said. "It would also give me direct linkage to the party. I'm still a Democrat and I still have to go through the nominating process and, eventually, the electorate. She also "was a hard worker," Dyer said. Doran dealt with complaints from city residents, "and constituent work isn't the easiest," he said. But as Dyer's aide, Doran had more than prestige - she also controlled all appointments to city boards and commissions, according to City Hall and Democratic sources. Dyer agree that Doran handled appointments to the city's 161 commission seats. "That was part of her job - to find people to serve, including Republicans," he said. But he denied giving her carte blanche to pick whomever she wanted, and said he always talked with Doran about appointments. "I still was the appointing authority. There were people she wanted that I didn't appoint because I wanted my own people," he said. Other sources, however, said Doran wielded commission appointments as favors or rewards to Democrats who pleased her. Appointees who didn't do what she wanted - support her choices for party nominations, contribute to party campaigns - were threatened with losing their seats, those sources said. A Democrat who is a former commission chairman said Doran boasted to her that she controlled all appointments. "In almost any commission that has any influence, that has any power, you'll find the same group involved; loyal Democrats who, shall I say, take orders," the ex-commission chairman added. Often, she said, there is an unspoken understanding with appointees. "All these people, to a certain extent, are required to be in fundraisers, selling raffle tickets. … Nobody says you have to, but you understand when the letters (correspondence from Dyer) stop coming in and your appointment stops at the end of the year," she said. Fourteen of the 22 current members of the Planning Commission, Zoning Commission and Zoning Board of Appeals contributed a total of $3,345 to the Democrats in the municipal campaigns of 1983 and 1985 and in the first six months of 1987. Of that total, $320 went to Dyer's campaign committees and $3,025 went to Democratic Town Committee coffers. Zoning Commission member John Leopold said he felt committee pressure to conform after state Rep. Lynn Taborsak was not renominated by the party last year. She forces a primary and won to become the Democratic candidate in the state's 109th House District. Leopold, who is the chairman of the Western Connecticut State University History Department, and he told a Third Ward town committee member last summer that he supported Taborsak. The member reacted with surprise, and "sarcastically wished me good luck," Leopold said. "It's a matter of how you read the person's statement," Leopold said. "I read it as a threat, without a doubt, a veiled threat: 'You don't play ball with us, we don't play ball with you.' "
Leopold said he does not yet know if he will be renominated to the Zoning Commission. Among the papers Doran left in her former mayoral office was a stack of correspondence from people indicating that she solicited contributions for the party. Dyer said he was surprised to discover those papers, as well town committee files. "She had far more political material here than she should have," Dyer said. He said he had instructed Doran to limit her politicking from City Hall to "the barest minimum." But sources said Doran's lobbying extended to trying to influence directly the recommendations of city planners and votes of commission members on zoning requests from specific businessmen. They said Doran lobbied Wayne Skelly numerous times when he was chairman of the Zoning Board of Appeals in 1982 and 1983 to look favorably on zoning variances requested by the Kovacs family. The 1983 case involved land near exit 8 on Interstate 84 that Rober and Paul Kovacs proposed for a gas station. The 1983 case involved side yard setback for Frank Kovacs' office on Newtown Road, and ex-ZBA member said. Skelly opposed both proposal, but before the ZBA took action on the requests, Doran tried to change his mind. "Give this guy (Kovacs) a hand, he's been loyal to the party," Doran told Skelly, according to the former ZBA member. The Exit 8 proposal was withdrawn after the ZBA referred the Kovacs brothers to the Zoning Commission. The Newtown Road request first was denied by the ZBA, then approved with restrictions. Dyer said he sometimes lobbies commissions when projects, such as a Toys 'R' Us store proposed for Backus Avenue, could cause problems for the city. He said such lobbying is part of his job as Danbury's top elected leader. Doran, he said, had no standing to do with same. "She abused her position and did it under my name. I'd told Mary Ann to stay out of it," Dyer said. Dyer said ZBA members Sally Estefan and Phyllis Garavel suggested that Doran lobbied the board members to support an appeal by Attick. Attick wanted to overturn a zoning permit granted to Edward Lashins for land next to lakefront property Attick owned and planned to develop. Dyer said he confronted Doran. "She said she felt Nick was getting unfair treatment," he said. "I told her she shouldn't be interfering in such matters." The ZBA members, including Garavel and Estafan, denied or said they could not remember being called by Doran prior to their vote on the appeal. Well, if Mary Ann Doran/Danbury RTC/Mark Boughton's attempt to re-locate the sixth ward polling location from the easily accessible Park Ave School to the "middle of nowhere" Moose Lodge isn't another example of their ongoing effort to supress the vote and rig the election, then you haven't been paying attention. Thankfully, the Danbury Democrats aren't staying silent on this nonsense. Danbury Mark Mark Boughton, Republican candidate for Governor, claiming a record of inclusion and accessibility as Mayor that includes recent courting of Hispanic and other minority communities, is now behind a controversial move to relocate a local polling place to one that makes it substantially harder for people to vote. Boughton and Danbury Republicans want to move voting in Danbury’s 6th Ward from its current location, Park Avenue School, where people have voted for over forty years and which is a highly visible public school, located on a main road with public transportation, lighting, sidewalks and access from multiple directions, to a private hall operated by the local Moose Lodge and which is located on a road without proper lighting, sidewalks, has access from only a single intersection, has no access to public transportation and which is so remote, that even Gary Mattson, the administrator for the Moose Lodge recently said to the Danbury Patch: "We're a hidden entity out here. It is a bit out of the way for a polling place." Critically, the NewsTimes editorial page, Danbury’s major daily newspaper, opposed the move with an editorial on Sunday, September 8, 2013. The paper’s opposition is shared by voters. During a wide spread canvas of voters in the Sixth Ward over this past weekend the response was overwhelmingly negative regarding the potential move. Well over a hundred voters, including Democrats, Republicans and unaffiliated voters, signed a petition opposing the move and asking that the City of Danbury leave their polling place where it is. Republicans justifications are a moving target. The Republican Registrar of Voters claims it’s more centrally located; the Mayor says it’s about safety during construction at the school - despite that fact that this directly contradicts his previous statements that ongoing school renovations pose no safety risk to the elementary school children attending classes. “The Mayor’s claims about safety are absurd: if it’s not safe for voters, then the Mayor needs to explain why he allowed school to open and children to return to class at Park Avenue,” said Danbury Democratic Party Chairman Joseph DaSilva. The move is also opposed by local officials, community leaders and Danbury’s Democratic Registrar of Voters, Marge Gallo, who submitted a detailed letter to the City Council. Danbury’s Hispanic Community has also voiced opposition. During an interview with the Danbury Newstimes, Ingrid Alvarez-DiMarzo, executive director of the Multicultural Center of Greater Danbury, said that many minorities and working-class families live in the neighborhood surrounding Park Avenue because of its easy access to services by both walking and public transit. “It’s not just the Hispanics and Latinos who would be impacted, but also the elderly and the working-class families. I can tell you which buses go to Park Avenue, but there aren’t any buses going to the [Moose] lodge,” said DiMarzo.